The second of two parts in the Real News' most recent series on the nickel miner strike in Sudbury, Canada. In part two, we document the fall-out after Vale management accused the striking union, the United Steelworkers, of appealing to racism in voting down the company's most recent contract offer. The striking workers, despite entering their ninth month on the picket line, rejected the offer by a rate of 88%, a higher 'no' vote than the one that originally put them on strike in July of 2009. The accusations of racism were flatly rejected by both the union, and visiting workers from around the world. Produced by Jesse Freeston and Bertrand Riviere. JESSE FREESTON, PRODUCER, TRNN: As reported in part one, on March 11, striking nickel miners from Sudbury, Canada, voted 88.7 percent not to accept the latest contract offer from Vale Inco. After more than eight months on strike, a greater percentage voted against the offer than did in the vote that put them on strike in the first place, back in July 2009. In an open letter to the Sudbury media, Vale Inco CEO Tito Martins blamed the decision in part on what he called, quote, "a global campaign of misinformation, racism, intolerance, and xenophobia." The allegations evoked a strong response from leadership of the union, the United steelworkers, whose international president, Leo Gerard, was in Sudbury last week. LEO GERARD, INTERNATIONAL PRESIDENT, UNITED STEELWORKERS (SUBTITLED TRANSLATION0: I resent him calling our members or me or my union racist. These are my sisters and brothers, and we have a global union [inaudible] global [inaudible] We don’t resent our brothers and sisters. We resent the management that is causing this strike unnecessarily. FREESTON: While there is little to suggest that the union has appealed directly to racism in order to rally support, they certainly appeal to Canadian nationalism, at times strongly emphasizing the Brazilian roots of Vale, such as a pamphlet the union circulated in Sudbury newspapers, which said, quote, "Canadian workers and citizens are demanding their right to be treated fairly by the extractor of a national resource, to be recognized as members of a sovereign nation, not a colony of an imperialist Brazilian corporation." Days earlier, the steelworkers played host to union representatives from Vale operations around the world, and their guests brought a clear message of solidarity with the Sudbury strikers. A spokesperson for Vale, Steve Ball, says that the arrival of the international workers doesn’t exclude the possibility of bigotry on the part of the union. STEVE BALL, CORPORATE AFFAIRS MANAGER, VALE INCO: Certainly we have enough proof over the last eight to nine months that that’s not always the case, that the kind of relationships you’re talking about have certainly been forged perhaps more recently, because we have seen cases of the Brazilian flag being burned, we’ve seen a lot of very anti-Brazil propaganda. And there’s no question that it’s been made a Canada versus Brazil argument at times, which is being completely unfair. As I said, it’s a global world now. Canadian companies own businesses in other parts of the world. FREESTON: And anti-Canada imagery has been used by opponents of Canadian mining corporations in other countries as well, such as this mural in El Salvador. The Real News spoke to visiting Brazilian union representative Gilson Dos Santos from the Brazilian Labor Congress. 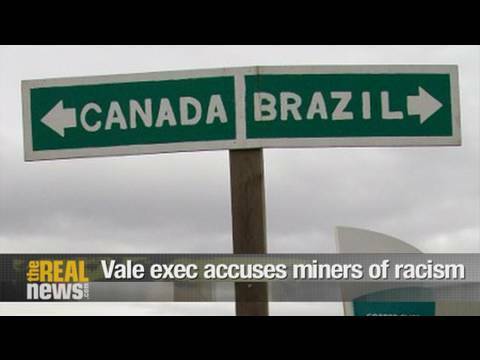 Despite the Sudbury workers’ anti-Brazil rhetoric, Dos Santos condemned Vale’s accusations of racism and xenophobia. GILSON DOS SANTOS, BRAZILIAN LABOR CONGRESS (SUBTITLED TRANSLATION): I see this as a desperate act, a bankrupt strategy, a hopeless strategy that they can’t go back on. Their new attacks are designed to divide us, an attempt to demoralize the global labor movement. FREESTON: The last sentence of the pamphlet the steelworkers sent out to the Sudbury community ended in big bold letters with the sentence, "Vale, this is a Canadian community you’re dealing with." Vale executives say it is precisely this attitude, that Canadian communities are exceptional, that is the problem in Sudbury. In an interview with The Sudbury Star, Vale CEO Tito Martins painted Sudbury as a global outcast in a company spanning 35 countries across five continents. He said, quote, "We never had a problem with a union before. It’s the first time," going on to add, "… and we don’t have any problems with local communities and local authorities." This comment comes as 40 different civil society organizations in Brazil are joining to host the first international meeting for those affected by Vale. The event starts on April 12 in Rio de Janeiro and will be attended by community representatives from at least eight countries. All the international union representatives that The Real News spoke to in Sudbury countered Vale’s statements with their own experiences. They said that they would prefer to move up to similar wages and benefits that the Sudbury workers are fighting for, rather than having Sudbury come down to their level. As for the nationalist rhetoric of the Sudbury workers, the visiting Brazilian workers interpreted this as more of a cultural defense than an insult to communities in other countries. UNIDENTIFIED (SUBTITLED TRANSLATION): Vale isn’t respecting the culture, traditions, and history of the miners in Sudbury, traditions that guarantee a decent life for the workers. FREESTON: The Sudbury miners have a long history of fighting for the job safety and benefits that they enjoy today. This is the eighth time in just over 50 years that they have been out on strike. This past week, the current strike eclipsed the 1978-79 strike to become the longest in the city’s history. Dos Santos is impressed with the long memory of the Sudbury workers. DOS SANTOS: The union isn’t targeting the company’s profits or finances. It’s to respect those who sacrificed for what the workers enjoy today. In Brazil we could use some of this. Today our focus is on wages and social justice issues, without thinking about our predecessors. Many people are only thinking about themselves. FREESTON: But Dos Santos was surprised that the strikers had allowed replacement workers, or scabs, to enter the mines, something he says doesn’t happen in Brazil. DOS SANTOS: When there’s a strike, the workers make a picket that blocks off the worksite. They set up at the door of the company and don’t let a single worker enter. FREESTON: How mining companies should share their profits with workers and communities is central to the dispute in Sudbury. Vale wants to make changes to the workers’ nickel bonus, a profit sharing mechanism that is tied to the price of nickel. During the two years of high nickel prices following Vale’s purchase of Inco, Vale made roughly $4 billion in profit in Sudbury alone. Over that same period, the nickel bonus system provided Sudbury’s workers with around $200 million. BALL: It was an uncapped bonus system. No company that we’re aware of in the private sector has bonus systems that are completely unchecked. There has to be a level of reasonability within that bonus system. FREESTON: Vale wants the steelworkers to accept a bonus system similar to that of the company’s non-unionized staff. BALL: We have a performance incentive plan that’s based on our own performance and the performance of Vale as a company. We share in the profits of the company when the company is doing well, based on the performance of the company and our own objectives that we have to achieve, and there’s nothing wrong with that. Having a bonus system that’s tied entirely to the price of the commodity, again, doesn’t meet our business needs for the future. FREESTON: Tito Martins told The Sudbury Star that the workers should start identifying as part of the company, not as its adversaries, saying, quote, "We need to have our people committed to produce more in a more efficient way and in order to do so we need to have them committed to the performance of the company." He added that the company has the highest of goals, saying, quote, "We want to be the biggest mining company in the world, and there is only (one) way to do it. Getting bigger, producing more, growing." GERARD: ï¿½the resources owned by a multinational company who feels no allegiance to the community but simply has an allegiance to maximizing profitability as quickly as possible. And so thatï¿½to dispute about how will the community benefit from the extraction of those resourcesï¿½. And the way we’ve done that over the years in Sudbury is with the workers getting a bonus based on the price of the commodity, so that when the price of the commodity is higher, more of it comes to the workers, who ultimately spent it in the community. So it’s a way of returning some of the wealth that’s extracted from these mines in this community back to the community and that there can be some benefit from that. So the workers that were here from all around the world, they see that, they understand it, and they believe in it. FREESTON: Activists from places where workers face incomparably worse conditions than Sudbury also came to show support for the strike. UNIDENTIFIED, TORONTO COMMITTEE IN SUPPORT OF WORKERS IN IRAN: We have the same problem, even worse, in Iran. Over there, people, workers, they cannot get their pay on time. Unfortunately, they get fired, they get tortured because of their political activity, they get disappeared all of a sudden, they get put in jail, and they’ve been executed for many, many years, since Islamic revolution. We are here to support the workers in Sudbury because we do believe that we all suffer from the same problems. UNIDENTIFIED: The victory of the Canadian workers will be a victory for workers all over the world. FREESTON: At the rally, the Brazilian workers exchanged flags of representatives of the Anishinabek nation, the original inhabitants of the Sudbury Basin. The Anishinabek, like indigenous nations across Canada, have faced and continue to face various forms of racism. PATRICK WEDASEH MADAHBEE, GRAND CHIEF, UNION OF ONTARIO INDIANS (SUBTITLED TRANSLATION): Last fall, in our general assembly, I brought to the attention of our chiefs the hardship that the workers were going through here, with Vale Inco treating them with such disrespect. We had a resolution passed in support of the United Steelworkers here, and it was passed unanimously by all of our chiefs. FREESTON: The Real News spoke to Deputy Grand Chief of the Union of Ontario Indians Glen Hare, who is particularly interested in a confidential agreement between Vale and the Canadian government that the feds are refusing to make public. GLEN HARE, DEP. GRAND CHIEF, UNION OF ONTARIO INDIANS: You know, we go back a long ways, too, in our struggles and our fights as first nations, when we go back as far as the Treaties. And the Treaties, our treaties, have never been honored. Today, I’m rejuvenated again because of the solidarity, the people standing together. FREESTON: Germany’s Mining, Chemical and Energy Industrial Union announced it had already taken concrete action in solidarity with the Canadian miners. MICHAEL WOLTERS, MINING, CHEMICAL AND ENERGY UNION: Last fall, when there was a first ship coming to Europe to bring over the [inaudible] from your mill here, produced by terrible scabs, we made sure in public in Germany, in the newspapers and [inaudible] that Vale Inco will see all over the world that we are aware of their [inaudible] behavior here in Sudbury. FREESTON: The callout for the first international meeting of those affected by Vale has the following to say about labor struggles: quote, "Vale has used the global economic crisis to pressure its workers throughout the world … reducing rights previously won … through years of struggle. The strike launched by Valeï¿½s Canadian workers in June 2009 provides an important example of. . . . the construction of our international unity." It remains to be seen whether or not that unity will translate into more coordinated action that puts real pressure on the company.